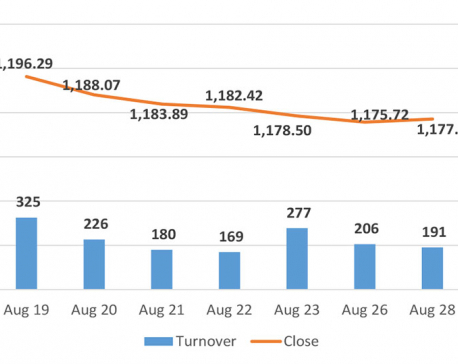 KATHMANDU, AUg 22: Stocks fell for consecutive days on Tuesday as the benchmark Nepal Stock Exchange (Nepse) index ended the day 4.18 percent lower to 1,183.9 points. The market remained under pressure since the beginning of Tuesday's session, losing more than 5 points by midday. Even though positive sentiment prevailed in the previous week amid upbeat earnings reports published by heavyweight banks, the market could not hold on to the gains. The sell-off came on the back of profit booking by traders. 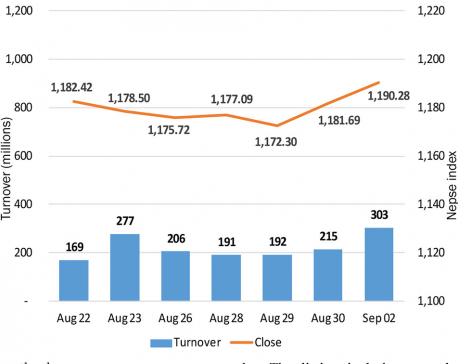 Further, the bourse, which remained comparatively active last week, recorded a dismal turnover of only Rs 179 million on Tuesday. Sectoral indices posted modest moves to either side of the chart. Trading stocks were the biggest gainers of the as the group's sub-index rose over 1.44 percent. Besides, sub-indices of 'Others', Non-Life Insurance and Hydropower segments closed slightly in green. On the other hand, Manufacturing & Processing stocks were the major drag as their sub-index lost 1.03 percent. Microfinance sub-index dropped 0.69 percent, while Banking sub-index went down by 0.53 percent. Hotels, Finance and Development Bank sub-indices also closed lower. Market participation was dominated by Banking and Insurance stocks. Global IME Bank Ltd led the table of listed companies as Rs 11 million worth of its shares changed hands on the day. It was followed by Premier Insurance Company Ltd and Prabhu Insurance Ltd with total transactions of over Rs 7 million each. Furthermore, NLG Insurance Company Ltd, Nepal Investment Bank Ltd and Chilime Hydropower Company Ltd registered turnovers of over Rs 5 million each. Salt Trading Corporation led the list of companies in terms of advances as it added 4.83 percent on its share price on Tuesday. Sindhu Bikash Bank Ltd, which lost almost 10 percent on Monday, retraced and climbed 4.31 percent. United Modi Hydropower Ltd also closed 2.44 percent higher. Besides, Gurans Life Insurance Company Ltd and World Merchant Banking and Finance Ltd also gained over 2 percent each. Gurkhas Finance Ltd oversaw worst performance of the day. Its share price fell by 4.54 percent. Development bank stocks followed suit, as share prices of Green Development Bank Ltd and Sahayogi Bikas Bank Ltd dropped by over 4 percent each. Deprosc Laghubitta Bittiya Sanstha Ltd, Api Power Company Ltd and Sanima Equity Fund were the other losing securities. 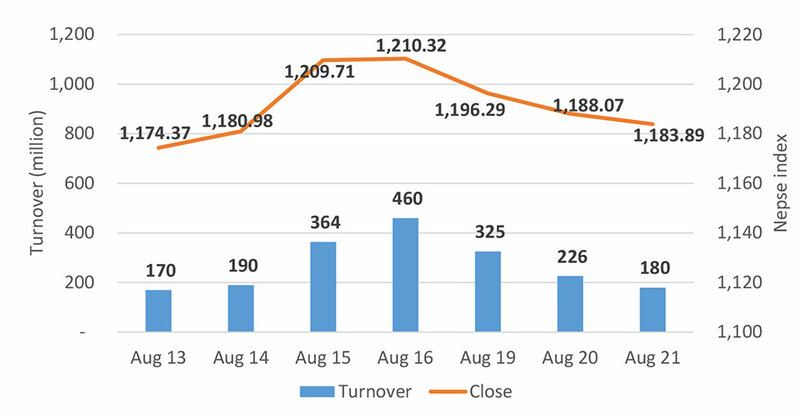 On the corporate space, Progressive Finance Ltd started floating 281 percent rights issues to its shareholders on Tuesday. After the issue, the finance company's capital will reach the mandatory minimum regulatory requirement of Rs 800 million. ARKS technical analysis model indicates the market retracing after four straight days of gains in the previous week. Consequently, the index has continued to trend range bound with technical indicators presenting indecision among investors. A significant breakout from the consolidation range of 1,180 to 1,200 points is still to be observed. A breach toward either side of the spectrum is likely to present further direction for the equity market.